Cold. Snow. Brrr. As a gardener, by February you itch for Spring — for that first hint of color and fragrance that heralds the next green season. 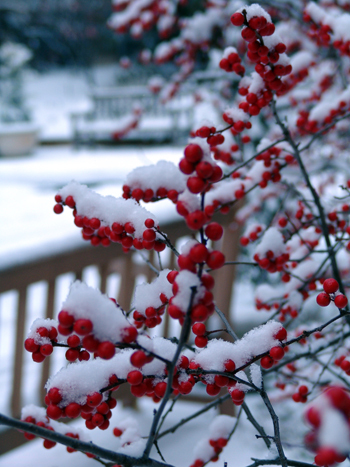 You keep the songbirds fed; stay close to the heated indoors; and look out on a largely monochrome landscape whose biggest punch of color may be holly or winter berries. The angle of the sun in the garden provides the greatest drama this season of the year. 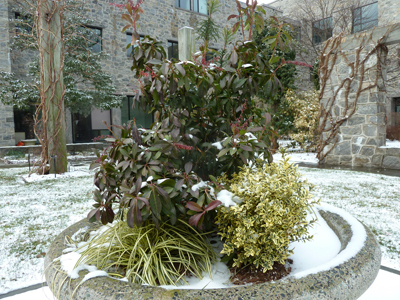 Another way to liven up your landscape is to add winter containers. These beauties add can add texture and interest during a rather dull season. 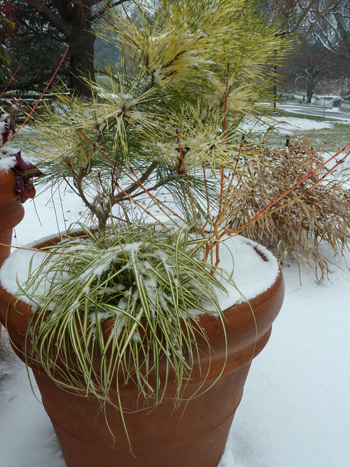 Check out three tips to creating great winter containers. Use multiple containers of different sizes and group them together for greater visual impact. Plant the pots very densely to create a fuller look since the cooler season means less room needed for root growth and foliage expansion. Watering is important, especially if the containers are sheltered under an overhang or somewhere where natural precipitation can’t reach. Roots do still take up water and strong winter winds can dry out the soil rather quickly. Open up that horizon next winter. It’s not finished with Fall! 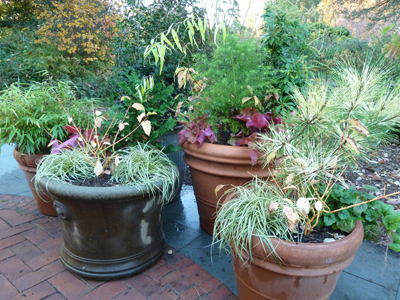 Our biennial Plant Sale at the Scott Arboretum in September 2013 will feature over 70 plant varieties that add interest and punch to winter container gardens and landscapes. Treat yourself to an already planted container, or choose some unique perennial and woody combinations to take home and arrange in your own beds and pots. Liven up that September to March landscape! Look for the Plant Sale Handbook online in July to explore all the great plant varieties from which to craft a new winter garden. Check back periodically for blog updates and features regarding the Sale over the next 6 months, and mark your calendar now for the weekend of September 21st to shop the Sale. Our guest author, Cindy Kerr, is an avid container gardener and the chair of the 2013 Scott Associates Plant Sale.